I was privileged to get to interview one of Birmingham's most mysterious characters: Moist. The magical summer of 1967, playing ragball in the street and catching the bus to Rickwood Field to see Reggie Jackson. Wishing I had to do it all over again, on Blog Fifty. The Carol Ann Marks blog was about childhood Halloween. Pictures are involved of me as a punk teenager. My husband is working to protect us but not getting paid, which in my opinion is worse than being furloughed. In anger, I wrote this to Congress. The government shutdown is hitting us where it hurts. To make things worse, my husband still has to work without pay. So in my anger, I wrote this to Congress. Weekend football parties, AND listening to Mountain Man from Duck Dynasty speak. 8. Y'all Connect - Jenny Schmitt delves into the minds of millennials. 9. Media of Birmingham - 12 months since the Birmingham News cut publishing to three times a week. What has worked, and what hasn't? 10. Project Bulk - This is what a cheat day looks like. 11. 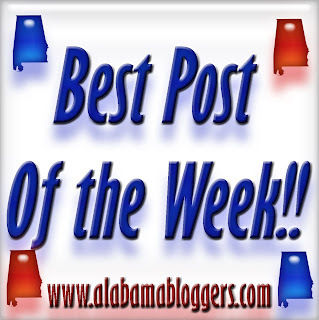 Birmingham Blogging Academy - I hope you'll join us for the Alabama Bloggers meetup on Oct. 18.
i don't believe in ghosts, but something weird called out my name. A super-niche post within a niche blog. However, it got all out of proportion hits, so it's my favorite for this week. #15 - This week on The Dairyman's Blog I share a story of how not taking my own safety advice led to a farm accident and minor injury that could have been much worse. Just a quick list of recent race results, which has become my newest obsession.